Carlos Calbillo, an award-winning filmmaker and longtime Houston Chicano community activist, was Thorne Dreyer's guest on Rag Radio, Friday, March 30, 2012, on Austin community radio station KOOP 91-7-FM, and streamed live on the Internet. Carlos Calbillo was active with SDS and the Mexican-American Youth Organization (MAYO) in Texas in the '60s and '70s, and edited the Houston Chicano newspaper, El Papel. He has worked in film and television and has produced numerous short films on subjects ranging from community activism to musical documentaries on Texas and Chicano/Latino musicians, including Doug Sahm, Freddy Fender, Mance Lipscomb, Little Joe y La Familia, and ZZ Top. His film, The Case of Joe Campos Torres, documented one of the most infamous cases of police misconduct in Houston history. Carlos is the Artist-in-Education at the Southwest Alternate Media Project in Houston, and teaches filmmaking at the Raul Yzaguirre School for Success in Houston’s East End. In addition to covering Carlos Calbillo's work as an activist and filmmaker -- and the underrecognized legacy of Chicano activism in Houston, Texas, and the Southwest -- we discuss the new Tejano Monument on the Texas Capitol grounds and the role of Tejanos in Texas history. Rag Radio, which has aired since September 2009 on KOOP 91.7-FM, a cooperatively-run all-volunteer community radio station in Austin, Texas, features hour-long in-depth interviews and discussion about issues of progressive politics, culture, and history. Hosted and produced by Rag Blog editor and long-time alternative journalist Thorne Dreyer, a pioneer of the Sixties underground press movement, Rag Radio is broadcast every Friday from 2-3 p.m. (CST) on KOOP and streamed live on the web. Rag Radio is also rebroadcast on Sundays at 10 a.m. (EST) on WFTE, 90.3-FM in Mt. 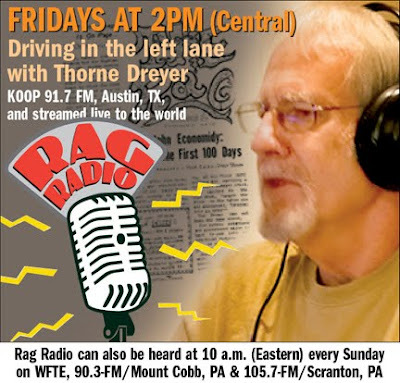 Cobb, PA, and 105.7-FM in Scranton, PA.
Rag Radio is produced in the KOOP studios, in association with The Rag Blog, a progressive internet newsmagazine, and the New Journalism Project, a Texas 501(c)(3) nonprofit corporation. Tracey Schulz is the show's engineer and co-producer. After broadcast, all episodes are posted as podcasts and can be downloaded at the Internet Archive. THIS FRIDAY, April 6, 2012: Progressive populist writer, commentator & orator Jim Hightower. April 13, 2012: Sustainability activist Bill Neiman of Native American Seeds. Robert Jensen : There Are Marxists in India? Harry Targ : Take a Deep Breath! James Retherford : Old Skool Reunion!